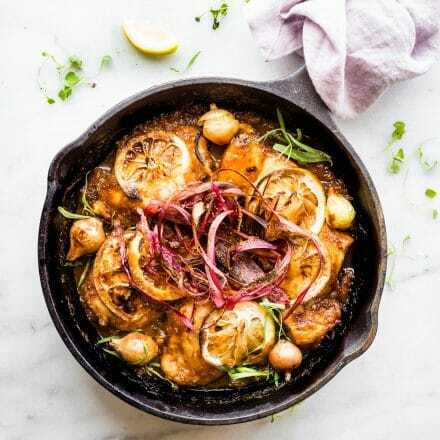 This Crispy Rhubarb Lemon Chicken Bake makes an easy one pan meal! 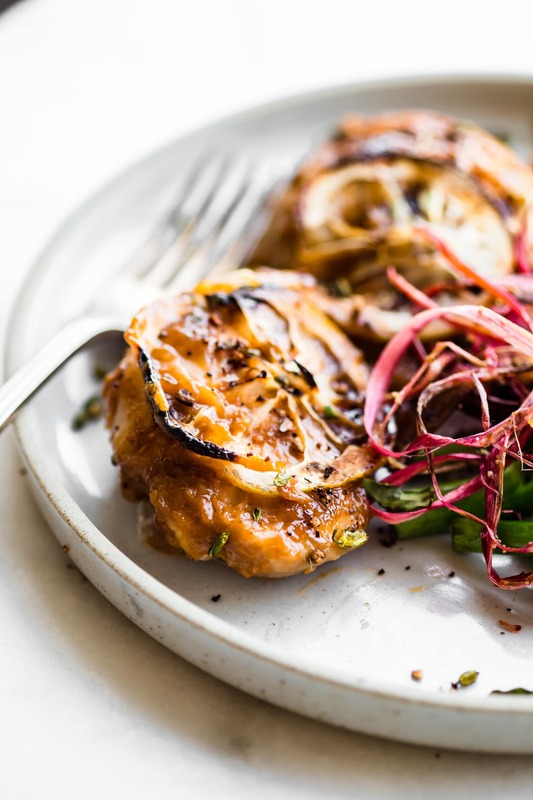 A tangy Rhubarb marinade caramelizes the chicken while baking. The lemon slices on top give it extra sweetness. A chicken bake that’s paleo friendly and super flavorful. Don’t forget the crispy rhubarb shavings on top! Crucial for texture and flavor. I almost missed out. Missed out on Rhubarb’s PEAK season. That fruit..er… veggie.. gets all the rage when it’s in season. Rhubarb is a vegetable that is often categorized as a fruit. If I were a vegetable, I’d so want to be rhubarb. It’s trendy, only works 3 months out of the year, pretty in pink, sweet and savory, healthy, and sassy. Okay I added the sassy part, but don’t you think it’s true? I can hear it saying “Hey, I’m a pink plant stalk. I DO WONDERS with flavors. Am I sweet or sour or both? Oh I am ALL all that and a bag of chips!” Ya Rhubarb, you are that rad. Despite my weirdly prophetic obsession with this produce, I do have a purpose to this recipe. 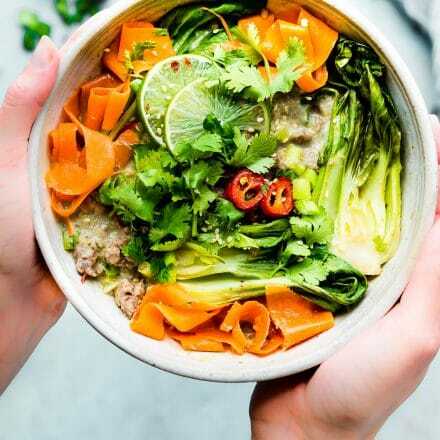 This is a scrappy chef Cotter recipe, a resourceful yet darlingly trendy. Maybe? Yes, let’s go with it. 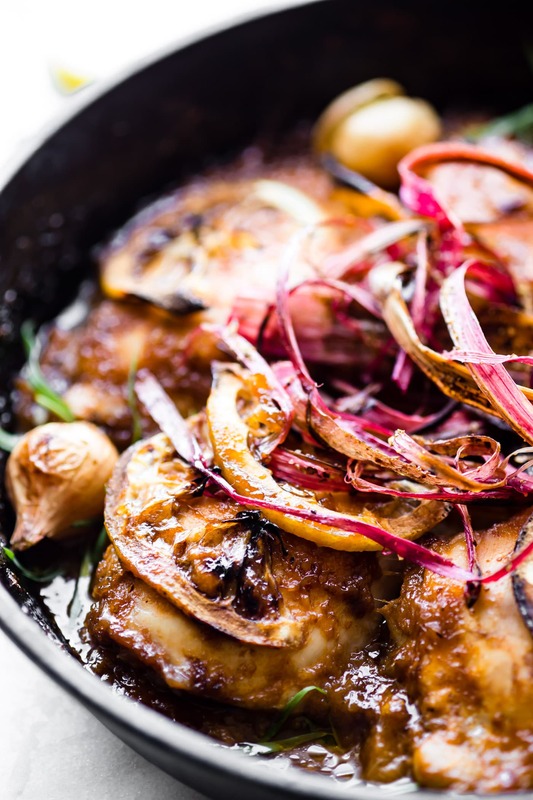 Crispy Rhubarb Lemon Chicken Bake. It’s paleo, naturally. But also, this chicken recipe involves using ALL parts of the rhubarb, except the leaves, don’t eat the leaves, warning. But the stalk, oh yes, you don’t want to miss all that nourishment coming from that pink stem. 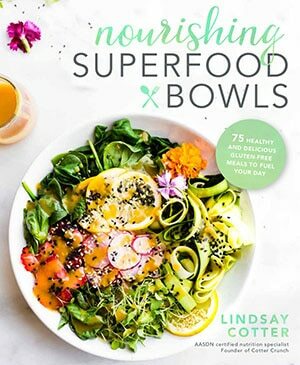 It’s loaded with minerals (such as calcium, potassium, manganese, and magnesium) , fiber, protein, vitamin C, vitamin K, B vitamins, and more. Like whoa! It’s also a great aid for digestion. Hmmm. maybe that’s why they put rhubarb in a strawberry pie. You’re gonna need that extra digestion boost post pie consumption. But I digress. Today’s lemon chicken bake recipe is all about tangy, sweet, and savory. 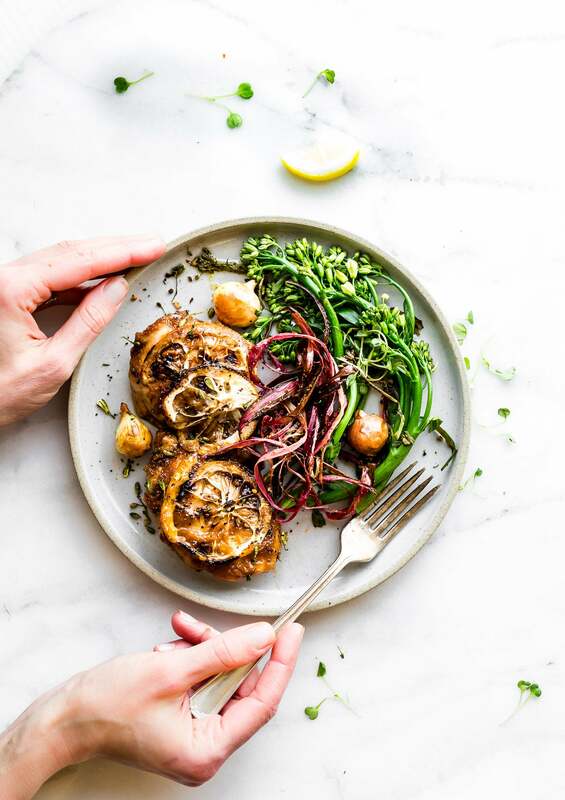 This chicken bake is made with a maple rhubarb marinade, lemon, and topped with crispy rhubarb shavings (peeled and baked veggie skins make awesome snacks or toppings). 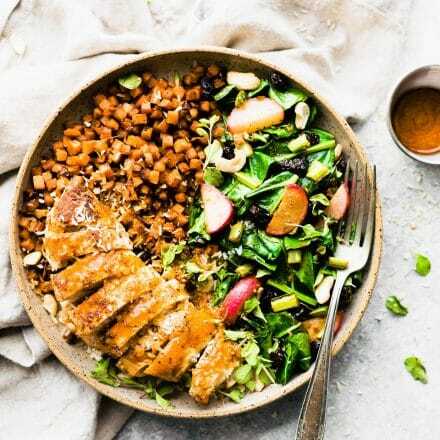 It’s one SUPER nourishing protein packed meal ya’ll! 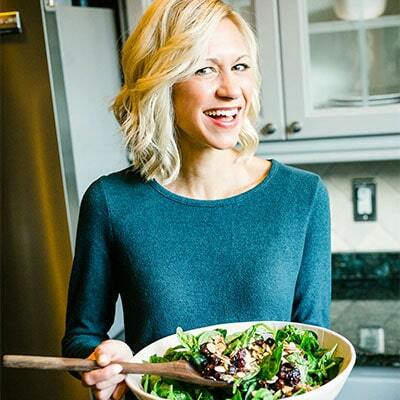 You’re probably thinking… um… Lindsay, a rhubarb marinade? You crazy Cotter you! Why yes, I am crazy. But it works. Since rhubarb has a sour acidic taste, it pairs well with sweet tangy food. To make the rhubarb marinade all you do is shave the stalk (keep the shavings) with maple syrup, salt/pepper, lemon, and creamy balsamic dressing. Place that marinade in a pan with your chicken thighs (skinless). You then quickly bring to a boil in the pan with chicken until the marinade is a little caramelized, coating the chicken. 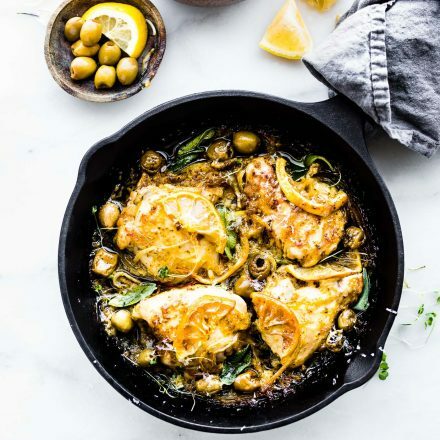 This Lemon Chicken Bake makes an easy one pan meal! A tangy rhubarb marinade caramelizes the chicken. Lemon and crispy Rhubarb shavings to top! Gluten free and Paleo friendly. Clean rhubarb stalks and trim ends. With a vegetable peeler, gently peel the red skin of the rhubarb off in order to create shavings. See pictures in blog post. Set shavings aside. Place 2-3 small stalks of the rhubarb in a blender along with the BBQ sauce, balsamic dressing , maple syrup, and seasoning. Blend until creamy. Clean and trim your chicken thighs. Set aside. 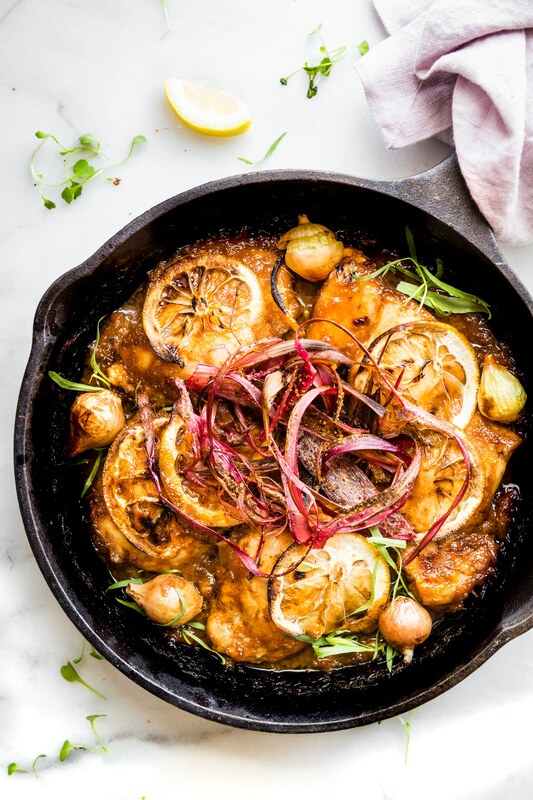 Add 1 tbsp olive oil to a oven safe skillet or cast iron skillet . You can use a dutch oven too. Add your marinade and your chicken thighs to the pan. Squeeze fresh lemon juice on top. Bring the marinade to a to a quick bubble/boil. You will see the edges start to caramelize on the pan. Then reduce heat or turn off completely. 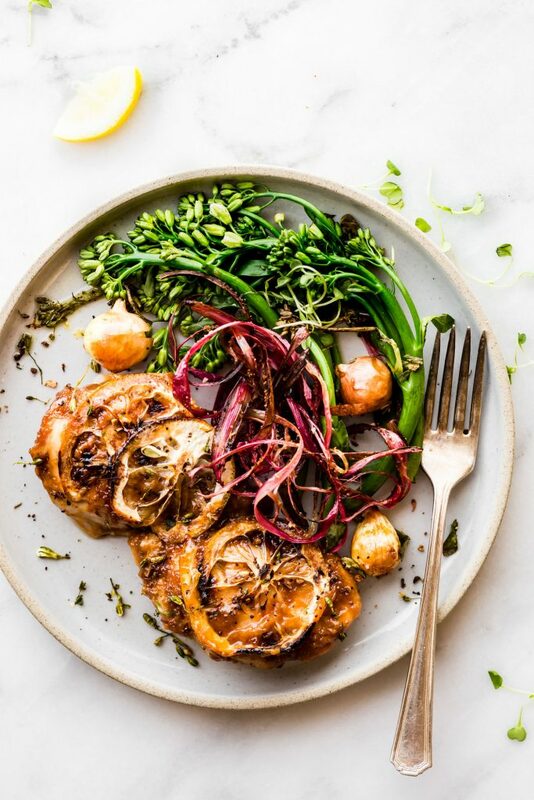 Flip the chicken thighs over and place lemon slices on top of each. Add 1 cup of peeled pearled onions to the pan. Drizzle a little olive oil on top of them. Salt/pepper to taste. Transfer to oven at 375F for about 20-25 minutes. While the chicken is baking for the first 10 minutes, season your rhubarb shavings. Just toss with a bit of oil, salt, pepper, and optional lemon pepper or lemon garlic. Once chicken and shavings are cooked and crispy, remove from oven. Serve chicken thighs in pan or to each plate. Add more marinade from the pan on top of each chicken. Then top the each chicken thigh with crispy rhubarb shavings and serve with pearl onions. You can add in any other veggies while the chicken is baking, too. Just place on another pan with olive oil. I added broccolini. The thicker rhubarb shavings will take longer to get crispy. So check after 10 minutes. If your shavings are thin, they will get crispy in less than 15 minutes in oven. Next add your lemon slices to your chicken and pop it in oven for just 20 minutes. BUT WAIT!!!! Here’s the EPIC part ya’ll. Take those shavings, toss in oil, pepper, garlic, salt, and place on baking sheet in oven (with the chicken) and bake the last 10-15 minutes with the chicken. They should get crispy! I added veggies in the oven while it was all cooking too. Saving time. Per usual. Anyway, the crispy rhubarb shavings totally make the dish. You top your lemon chicken bake with them and dig it. Like whoa.. so so fun and tasty! You see, rhubarb really is a badass. It makes a chicken bake look like a rockstar. In my honest opinion. P.S if you are watching your diet for oxalate containing foods, then cooking rhubarb may reduce its oxalate content. Sorry, nerdy nutrition note. Had to. p.p.s why is so hard to spell Rhubarb? That and frittata. Gah.. I always mess up. Thank goodness for spell check! Favorite rhubarb recipe? Ever baked it with chicken? Do share! I’ll surely agree with you on rhubarb’s (did I spell it right?) sassy factor – just like my daughter – it is lively, bold and oh so cheeky! I’ve only messed with it a couple of times and that too in sweet eats – never have I seen it like this before! You go you scrappy chef cotter! I’ve never made a recipe with rhubarb!! I wouldn’t know where to start! This sounds amazing- anything with a crisp wins me over hah! You gotta try it Carrie! I am so with you on the spelling. Frittata… how about omelet? And i it omelet or omelette? WTF. Anyway… this looks amazing. I have never been a fan of rhubarb in dessert, but I think I’d love it in something savory. Two thumbs up. Right? Let’s just keep spelling simple. Wine, cheese, FOOOOD. What an awesome way to use rhubarb!! I’ve never had it with chicken before…definitely need to try this! go for it! I think you’ll love it as much as we did! I am so with you on the love of rhubarb! I wish the season wasn’t so short. I just made some rhubarb muffins I’ll be posting soon and have a killer strawberry rhubarb mimosa on my blog – you’ve gotta check it out! Love that you used rhubarb in a savory way here. Can’t wait to try it! 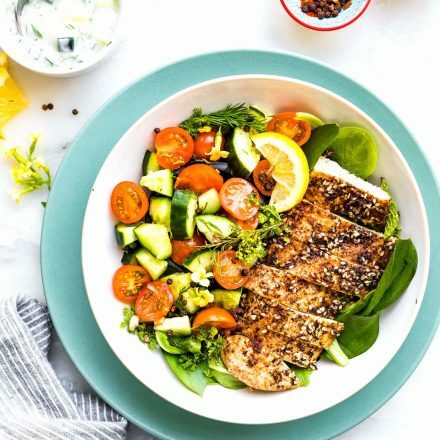 What kind of balsamic dressing do you use for the marinade? You have a rhubarb mimosa??? Omg I must check this out! Can you send me link?? Rhubarb has always intimidated me, but you may have just convinced me to try it with this recipe! I would have never thought to make something so unique, but I totally agree that rhubarb has a really tangy flavor, and it would probably work really well with other tangy flavors. I love how you’re not afraid to try anything. It looks so good; I can almost smell it in my head. send me some rhubarb! LOL! This is sooo clever!! I’ve actually never seen a shaved rhubarb recipe and I imagine it turns out sooo nice and crispy! I need this chicken in my life, no question about it! I haven’t made anything with rhubarb this season, so I need to hop to this! Oh i bet you will love it Julia! Keep me posted! We are so behind here, I haven’t seen rhubarb any where! But this looks wonderful. Haven’t tried rhubarb in a savory dish yet, but I so want to give this a go once our markets have it. Have you checked the freezer section? Sometimes I find it frozen there. Keep me posted! This recipe right here is just a perfect example of why I adore you. You’re using seasonal produce (holla for rhubarb) in an unusual way. I love me some rhubarb pie and crisp and never would have thought to pair it with poultry and yet I know this would be amazing. My hat is off to you. Rhubarb is one of my family’s favorite summertime veggies and I’m so happy to find a savory recipe to use it with! This was amazing. We all loved it all the way down to the twin 4 year olds! Keep ’em coming! Thanks for the adventurous dinner! woohoo! Let me know what you think Christina! Jus discovered you and already just made the tuna green chile casserole for my dinner tonight! 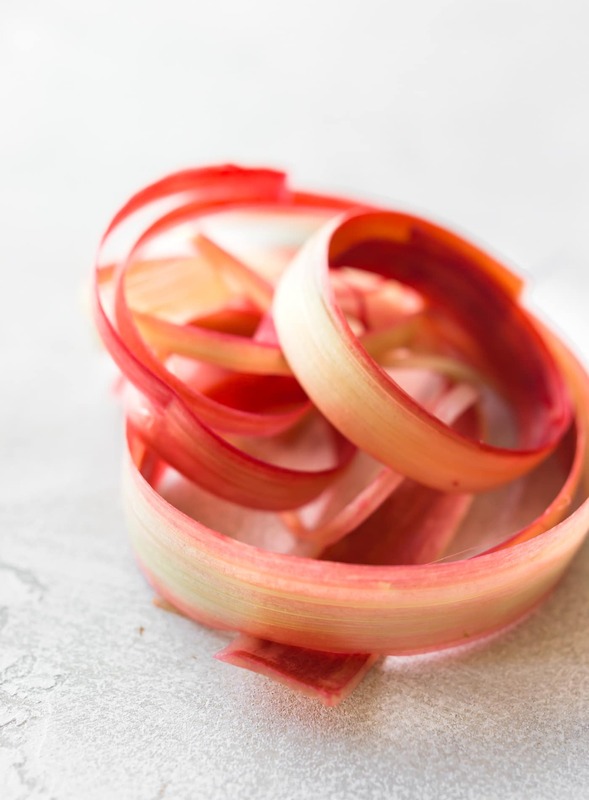 I was wondering what a good substitution for rhubarb would be for this dish in case I have trouble finding it, as it isn’t the season right now. OH yay! So glad. How did it turn out? As far as this chicken goes, hmm…. I’m thinking maybe try green apple or pink lady apple but don’t add as much maple, maybe? Let me know if you try that! Hello 😊, I loved your blog on the anti inflammatory meal plan intact I am making all but 2 this next week. 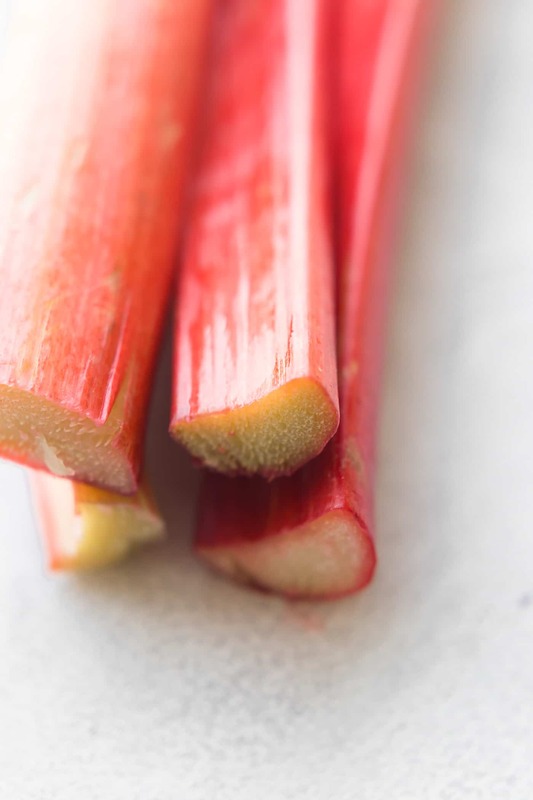 However I have hunted everywhere for frozen rhubarb today with no luck .. is there anything else that you think would work well on this occasion to blend with sauce? Thanks again for some fab recipes very excited to try them all..